The fifth round of the Reykjavik Open is underway. | Photo: Fiona Steil-Antoni/Reykjavik Open. The rising star GM Alireza Firouzja of Iran is sharing the lead together with GM Robert Hovhannisyan, GM Sergei Movsesian (both Armenia) and GM Constantin Lupulescu (Romania) at the Reykjavik Open. After today's rest day, four more rounds will be played. 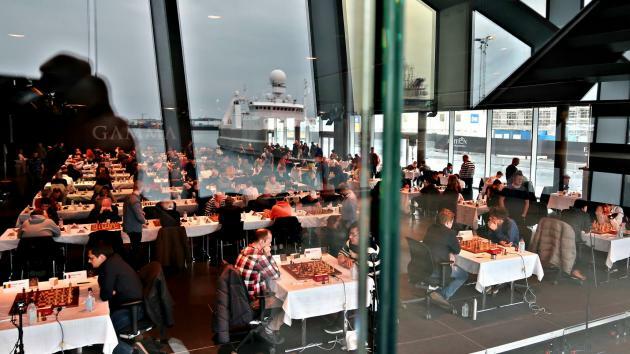 The Reykjavik Open is being held for the 33rd time. The tournament winners of this long-running event include Mikhail Tal (the first edition in 1964), Fridrik Olafsson, Vasily Smyslov, Fabiano Caruana, Anish Giri and, last year, Baskaran Adhiban. Once again the beautiful concert hall Harpa in the harbor of the Icelandic capital his hosting the tournament, which runs April 8-16. Five rounds have been played so far. Tournament director Gunnar Bjornsson and FIDE president Arkady Dvorkovich watch Iceland's prime minister Katrin Jakobsdottir make the first move for Gawain Jones in round one. | Photo: Fiona Steil-Antoni/Reykjavik Open. In the early rounds of a strong open tournament like this one, there will always be a few upsets or almost-upsets, which speak to the imagination of the amateur chess player who dreams to beat a very strong opponent one day. Let's see what happened in Reykjavik. Second-seeded GM Nils Grandelius of Sweden needed all his calculation skills to hold off Dutchman Henk-Jan Visser in the first round on Monday. The latter has been a steady 2200-high player for many years with a pretty good opening repertoire. However, in this game Visser had an early move-order issue that got him in some trouble. But when Grandelius played inaccurately, the game was suddenly unclear again. But as so often happens, experience (and Elo) decided it in the end. Visser vs Grandelius watched by the FIDE president. | Photo: Fiona Steil-Antoni/Reykjavik Open. Kirk Ghazarian (2209) held GM Abhijeet Gupta to a draw, and Atli Freyr Kristjansson (2198) did the same against GM Vladimir Potkin. Not a great start for Andrew Tang. | Photo: Fiona Steil-Antoni/Reykjavik Open. Tuesday was the dreaded day with double rounds. The first (round two of the tournament) started at 9 a.m. and the two top seeds already dropped half-points. GM Gawain Jones faced the talented IM Dinara Saduakassova, whereas Grandelius couldn't beat Zhen Yu Cyrus Low, an IM from Singapore. Iceland's GM Hjorvar Steinn Gretarsson went down against IM Justin Sarkar (USA, 2337), who clearly knew his classics. He executed the King's Indian attack, which Bobby Fischer himself had done in several nice games, mostly with White but also once as Black (added to the annotations). The American player allowed Gretarsson back in the game, but then came with a wonderful second (and this time decisive) wave of the attack. An early loss for Abhijeet Gupta, the winner of the 2016 Reykjavik Open. | Photo: Fiona Steil-Antoni/Reykjavik Open. Round five on Thursday was a particularly bloody round, with decisive results on the top eight boards. Grandelius vs Hovhannisyan in round five. | Photo: Fiona Steil-Antoni/Reykjavik Open. Two months before turning 16, the Iranian GM Firouzja has already become a household name in the chess world. Only a few days ago he put up a great fight against Hikaru Nakamura in the Bullet Chess Championship, and right now he is sharing the lead in Reykjavik. In round five, Firouzja defeated Potkin on board two to join the group with 4.5 points. The Russian GM couldn't find the best plan in the endgame, and suddenly White's a-pawn was running fast. A good first half for Alireza Firouzja. | Photo: Fiona Steil-Antoni/Reykjavik Open. Besides Hovhannisyan, another Armenian player is also in first place. Movsesian might have confused his opponent (a 12-time Icelandic champion!) a bit with the strange-looking 11.Qd2, about which Spanish GM Paco Vallejo tweeted: "Learn the rules. Break the rules." It seems to aim for pushing d3-d4 while protecting f2, but it's probably too weird to be good enough for an advantage. Black should definitely have taken on d4 at some point in this game; after that he didn't he got too passive and was outplayed nicely. Sergei Movsesian, a regular guest at the Reykjavik Open. | Photo: Fiona Steil-Antoni/Reykjavik Open. The young Indian GMs Praggnanandhaa and Gukesh are playing in Reykjavik Open as well. | Photo: Fiona Steil-Antoni/Reykjavik Open. Friday, April 12 is a rest day but the playing hall will be full of players anyway. For the second year in a row, the European Fischer Random Championship will be held. The winner this year will qualify for a very strong Fischer Random knockout tournament organized in Norway in October, about which Chess.com will be publishing information very soon.